Colorado’s winter might appear bleak, with snowy mountains, frozen rivers, bitter cold, and an atmosphere that might appear discouraging to avid fly fishermen. But for those who are looking to cast year round, Colorado’s rivers still flow throughout the cold seasons, and hold hidden gems that are enticing to even the most experienced of anglers. From the Upper Colorado, to Dillon Reservoir and the South Platte River, Colorado’s fly-fishing stays open throughout the snowy months, and we’re ready to take you there. Check out some of our favorite winter fly-fishing destinations. Deep in the canyons of the South Platte River and Elevenmile Canyon, fish tend to congregate in the deep holes during the cold months, and anglers can find themselves casting for excellent stocks of carp and trout. The river is one of the few places in Colorado with year-round fishing options, and fishermen are particularly excited to find options for beginner to experienced casters alike. One of the more popular spots for a plethora of fishermen is Cheeseman Canyon with one of the longest public tailwaters in the state and a gold medal fishery. Cheeseman is especially known for it’s medium to large sized brown trout and several species of carp. For the best winter fly-fishing close to Denver, the South Platte River is the definitive local favorite. For fishermen who want to head farther out, Estes Park’s majestic scenery in winter is an anglers dream, and just under the dam, the waters are flowing and the fish are magnificent. 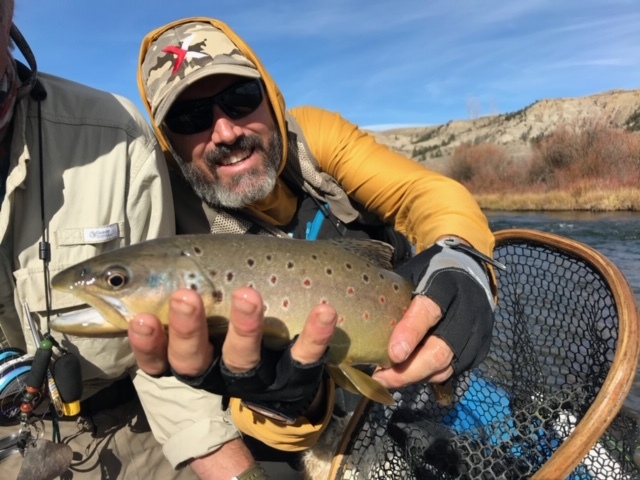 The Big Thompson River, which flows just outside of the confines of Rocky Mountain National Park, is home to several species of trout, with minimal concerns of the river icing over. The river runs at a low cfs, and the water is crystal clear, and anglers will find themselves casting for deeper pockets where trout reside in cooler temperatures. Expect small to moderate catches ranging from 12-16 inches. The Big Thompson River is an excellent option for those looking for more winter solitude and an experience closer to the park. The Big Thompson River is your wilderness experience in winter. One of the pride and joys of Colorado fly-fishing, the Upper Colorado River is one of the few absolutely consistent rivers in the state, with a gorgeous setting and world-class fly-fishing throughout the year. 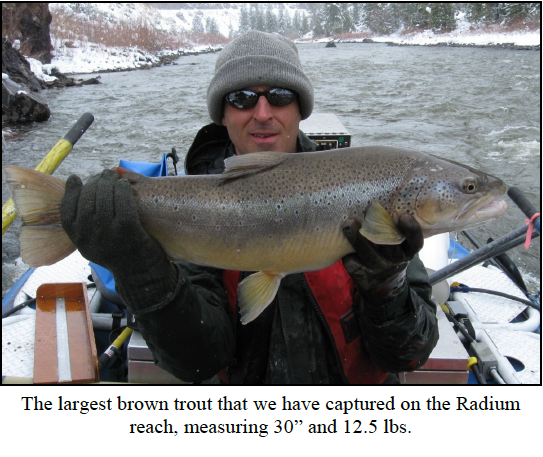 Set in the red rock canyons near Kremmling, the Upper Colorado, anglers will cast for medium to large sized brown and rainbow trout, with a number of easy access points from the road. It’s a great option for fishermen who want to enjoy the crowds who are headed for the South Platte, and lets anglers enjoy large sections of the river in relative solitude, while casting for large winter trout. The Upper Colorado is one of Colorado’s dream winter destinations. Some or our favorite winter fly fishing patterns for January on the Upper Colorado River: Black Beauty (Pupa) Size 18-22, Brassie (Larva / Pupa) 18-24, Renegrade Midge Size 18-22, Prince Nymph Size 12-18. What could be better than skiing and catching trout in the same day? The high country of Summit County features rivers that are resistant to freezing and some of the largest brown, rainbow, and cutbow trout in the state. With it’s urban proximity and easy to access waters, the Blue River has crystal clear waters and deep pools where the fish congregate. The advantage of the Blue River is that the water is constantly moving, and the fish are more likely to be where meals are easier. The fish in the winter are more prone to be conserving energy, where they’ll be looking for fast moving streams where they don’t have to work as hard to find food, so expect to be casting in deep pockets and between reeds. With it’s proximity to the urban area of Silverthorne. Some or our favorite winter fly fishing patterns for January on the Upper Upper Blue River: Mysis Shrimp Sizes 12-16, Scuds Sizes 12-16, Griffith’s Midge (Adult Cluster), Sizes 18-24, Brassie, (Larva / Pupa) Sizes 18-24. 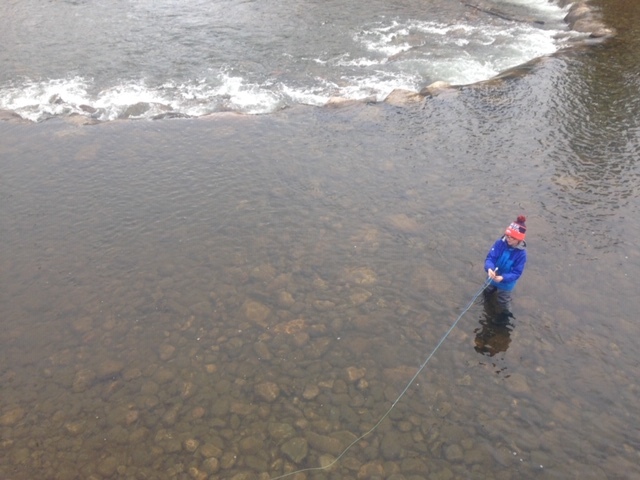 Winter fly-fishing is a whole different game from the summer. For best results, look for sunny areas, or fish on calm, sunny, snowless days, where the fish are more likely to surface. Since the fish tend to hang out in deep pockets where food is more plentiful, aim to fish slow and deep and use lines that sink, all while being on the lookout for rises. Dress warmly and comfortably and drink warm, as conditions may involve long periods of inactivity. Winter fly-fishing is an opportunity to get away from the crowds and enjoy a true wilderness experience in a completely different environment. Call Colorado Wilderness Rides and Guides at 720 242 9828 to book your winter fly fishing adventure today!